The SMGSS801P can provide up to 30 Watts of power to attached devices, such as VoIP phones, wireless access points, surveillance cameras etc, all over existing Cat. 5 cables. The switch can deliver up to 30 Watts on 4 ports, or up to 15.4 Watts on all 8 ports. The total PoE power budget is 120W. The switch eliminates the need for individual power sources for devices in the network, saving on costs for power cables and avoiding power outlet availability issues. When two 802.3az-compliant switches are connected, up to 74.2%* of power consumption can be saved. The SMCGS801P's simple design does not include any cooling fans, enabling the unit to run completely silently and reliably in whatever location it is installed. When the switch receives a frame tagged with an 802.1p priority tag, it is placed in the appropriate priority queue. Priority queuing is useful in environments where time-sensitive data, such as voice and video, are streamed across the network. 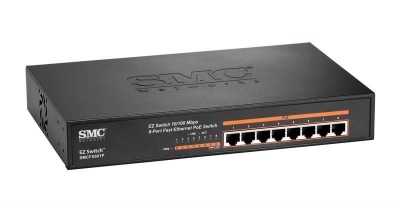 SMC Network's SMCGS801P 8-port 10/100/1000 Mbps desktop PoE switch provides seamless network connections, integrating 1000 Mbps Gigabit Ethernet and 10/100 Mbps Ethernet network capabilities. The PoE ports can automatically detect and supply power to IEEE 802.3af/at-compliant Powered Devices (PDs). The electrical power is transmitted along with data in one single cable allowing you to expand your network where there are no power lines or outlets, to where you need to install devices such as APs, IP cameras, or IP phones etc. The SMCGS801P is easy to install and requires no configuration. With outstanding performance and quality, the 8-port 10/100/1000 Mbps desktop PoE switch is an ideal choice for expanding your home or office network.